If you find yourself falling in love with the albatross in Honu Point's neighborhood, consider a walk with Cathy Granholm. She lives just down the street and checks on the albatross almost daily. With her computerized list of tag numbers handy, she scouts the neighborhood (and Princeville in general) to see which adults have flown in. She has been following some of these adults for years and has a family tree showing the lineage of many of the birds. She also checks each nest to make sure the chicks are progressing as they should. Albatross season is from November to July. 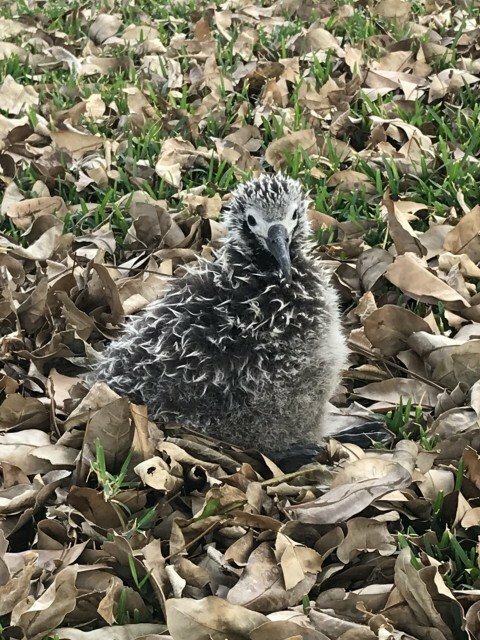 Currently in the Honu Point neighborhood we have eight albatross chicks, all about one month old. Each one has been named by the lucky owners of the property where nests have been build. Pela (photo at one month old), born in the cul-de-sac in front of our property, was named by me. Pela means "soar" in Hawaiian. Five others chicks can easily be seen from the street. Their names are Lyn, Brodie, Devin, Cathy and Lii Manu. Storm and Michael are a bit hidden behind houses. All but Cathy and Michael have signs to help you find where the chicks are nesting. There is no way to determine (other than DNA testing) the gender of these birds. Cathy Granholm has agreed to offer up her walks to you, our guests, for a $25 (or more) donation per group to Save Our Shearwaters. This organization rehabilitates all native Hawaiian birds on Kauai. So, if you are interested in learning more about our Laysan albatross and want to contribute to this cause, give Cathy a call and arrange a day and time. Her number is (808) 635-0727. Enjoy! For more of my blogs or to subscribe, go to the right-hand side of this page (full screen computers). For more information about Honu Point, our vacation rental on the north shore of Kauai, go to the other pages of this website. Mahalo!